It has been two years since Abigail Williams’s husband was killed in Afghanistan, and although she still grieves her loss, two years is beginning to seem like a long time to be single. Recent weddings of friends and the upcoming nuptials of her twin, Cooper, and her best friend, Dr. Haleigh Rae Mitchner (My One and Only), are making her even more conscious of being alone. One of the volunteer firemen who show up when Abby bakes a cake in a stove with defective wiring and sets her kitchen on fire briefly seems like a solution, but when she learns that the hot fireman (pun irresistible) is the grownup version of a kid for whom she once babysat, Abby feels like a perv for even considering him. It has been ten years since Justin Donovan left Ardent Springs for college and grad school and a high-profile career in property development in Chicago. He has returned to Ardent Springs after his personal and professional life went sour. He planned to contact Abby. The fire just provides an unexpected opportunity. He is no longer an adolescent with a supersize crush on his former babysitter. He is a man attracted to a woman he can’t forget, and he sees the five years between him and Abby as negligible. This time he won’t give up. Abby seems to be the only one with reservations, but, with a little help from her friends and a charity bachelor auction, she and Justin have their first date. When the hospital downsizes, Abby loses her nursing job, and she and Justin become partners in a landscaping business. Their partnership becomes personal too. But Justin’s Chicago past intrudes on his present, and the secrets he has kept jeopardize the life he and Abby are building. 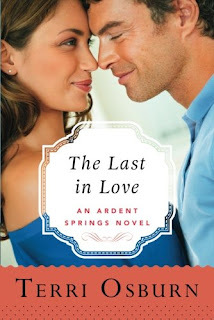 The Last in Love is the fifth book in Terri Osburn’s Ardent Springs series. Readers familiar with the earlier books will recognize Abby, but she is a more appealing character in her own story than she was as the embittered, interfering woman in her brother’s book. Some readers may find her hang up about the age difference tiresome. After all, five years is not a huge gap. Nevertheless, I found her focus on it credible because of the babysitting connection. It makes sense that she would struggle moving beyond that image. I have a friend who has been married for three decades to a former student five years her junior, and I know what an issue their former relationship was even though it was several years in the past when they began dating. Frankly, I had a more difficult time understanding Justin’s need to protect his secrets. Ardent Springs is a heartwarming community, and Abby and Justin’s story is a pleasing addition to a solid series. The characters are likable, the humor adds spark, and the romance is sweet with a touch of spice. Unfortunately, this book follows Her Hopes and Dreams, an unforgettable book that offers powerful emotional engagement, and for readers of that fourth book, The Last in Love may seem a letdown. Regardless, Osburn’s fans will appreciate a final visit to Ardent Springs, and new readers will find that this book can be enjoyed as a standalone.